At the end of the 17th century there was a great craze for tulips in Holland. To cater for this, the ingenious potters at Delft, particularly the 'Greek A' factory, produced huge pyramids of stacking flower holders. Normally prodeuced in pairs, they were highly decorative additions to palaces and country houses, with or without their flowers. They were particularly popular in England in the circle of courtiers around King William III of Orange. These 'pyramids', though, were surely modelled on Chinese pagodas rather than pyramids. This vase is one of a pair, each consisting of a base, supported by four royal lions with a globe in their paws, nine tiers of square flower holders with a spout on every corner and a finial in the shape of a female bust. Each tier could be filled with water and flowers would be placed in every spout. Even the finial has holes in the top of the head intended for more flowers. 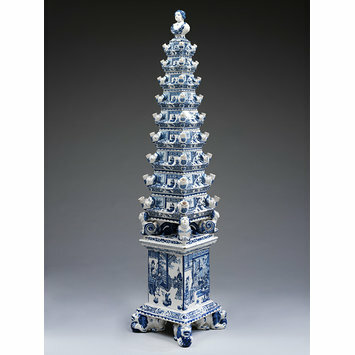 Tin-glazed earthenware flower pyramid, painted in cobalt-blue. From North Mymms Park and possibly made for the 1st Duke of Portland at the "Greek A" factory of Adrianus Koeks at Delft. 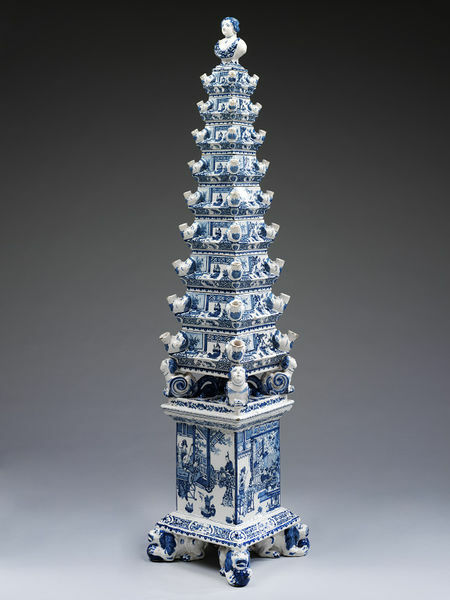 Tin-glazed earthenware flower pyramid, painted in cobalt-blue, Netherlands (Delft), ca. 1695. After the collapse of the Chinese Ming dynasty in 1644, the Dutch East India Company could no longer obtain Chinese porcelain. Delft potters began making blue-and-white pottery in imitation. Stacked flower holders like this were made to display tulips and other natural and artificial flowers in Dutch and English grand houses. Large and complex in construction, these pieces were hugely ambitious and costly to produce in earthenware.